The University of Connecticut has permanently expelled the Kappa Sigma fraternity following following the death of a student who was struck by a UConn fire department vehicle in October as she was returning home from a fraternity party. In February, six members of the Kappa Sigma fraternity -- Patrick Callahan, Matthew Moll, Austin Custodio, Dominic Godi, Dylan Morose and Jonathan Polansky -- were arrested and charged with various counts, including permitting a minor to illegally possess alcohol and sale or delivery to minors. Jeffny Pally, 19, of West Hartford, was coming home from a fraternity party early on the morning of Sunday, Oct. 16 and sat on the ground with her back against a garage bay door at the UConn Public Safety Complex at 126 North Eagleville Road in Storrs when the fire department received a call for service around 1:15 a.m., according to police. As police investigated, they learned that the fraternity and the Delta Gamma sorority got together to build a float for the homecoming parade and then there was an off-campus party where alcohol was provided, according to court documents. On Tuesday, UConn announced that the fraternity announced that the UConn chapter Kappa Sigma had been expelled from campus and will not be given the opportunity to reorganize. Typically, fraternities and sororities are given a chance to reorganize after several years if they follow certain steps, but UConn decided not to extend that privilege. 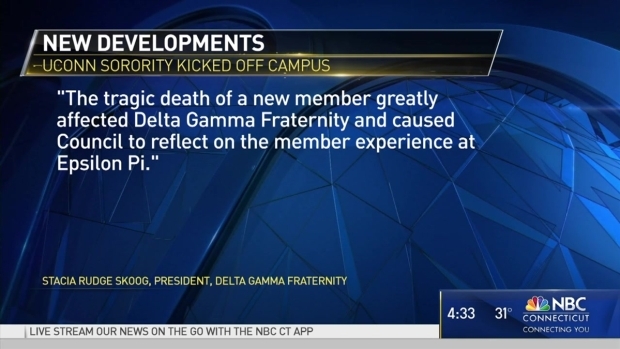 NBC Connecticut has reached out to Kappa Sigma for comment. UConn did remove Delta Gamma, and the national Delta Gamma fraternity council confirmed it would be closing the Epsilon Pi sorority chapter at UConn on Monday. Delta Gamma was not permanently barred from the university may have the opportunity to reorganize down the road. Jeffny was a sophomore majoring in allied health and aspired to be a nurse, according to the university. The 19-year-old worked as a resident assistant and was joining the sorority.